Each week, over the next few weeks, I'll feature recipes from different eras that appear in The Essential New York Times Cookbook. An excellent dish in every way. In Step 5, I added 4 teaspoons of lime juice. The serving style is very 1980’s -- if you’d prefer a more modern spin, do away with the nests. Spread the greens on a serving platter and spoon the beets and sauce on top (see photo above). 1. Peel beets with a vegetable peeler, and cut them into large strips the size of French fries. There should be about 3 cups. Coarsely chop the greens and reserve. 3. Add beets, and cook, stirring occasionally, until they turn translucent, about 10 minutes. Stir in cream, lower heat slightly, and cook 15 to 20 minutes more, or until beets are tender and cream has gently bubbled away to a thick sauce. Stir only often enough to prevent sticking and scorching. Do not overcook. 5. As soon as beets are tender, add lime juice in teaspoons and salt in pinches until seasoned to taste. 6. Heat a serving platter. To serve, arrange greens on platter, and using the back of a spoon form 6 little nests. 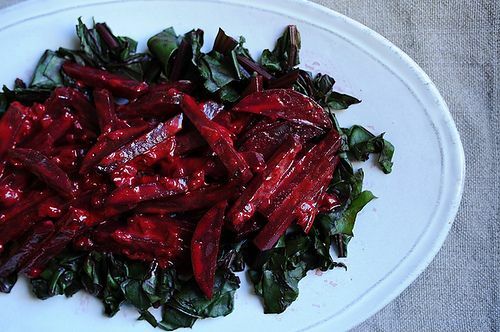 Remove beets from sauce with a slotted spoon, and put into nests. Garnish the platter with lime wedges, and pass the sauce separately. February 11, 1987: “Sweet Praise for Lowly Beets” by Leslie Land. Thank you for the yummy sounding 80's recipe!!! I can't wait to try it....will be picking up some beets this evening! They look wonderful! My mouth is watering. Yum! This dish looks wayyyy better than my hair did in 1987.